Christians are too slow. Slow off the mark in getting things done, slow to speak the truth in love, and slow to point out injustice and try to address it. 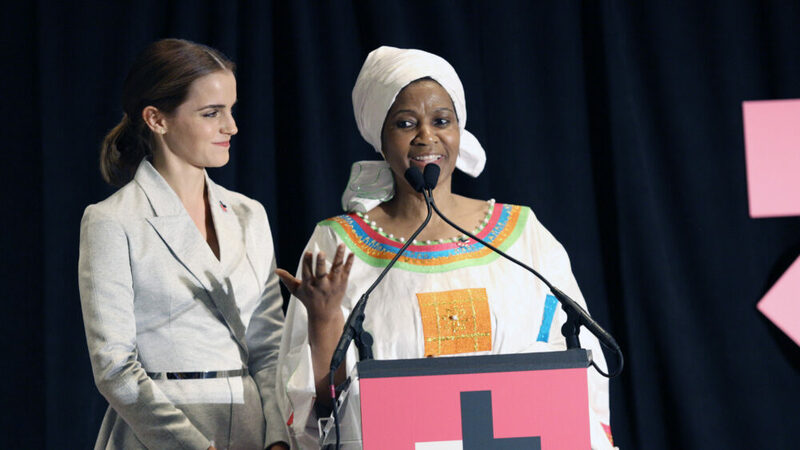 I came to this sweeping judgement recently while listening to actor Emma Watson make such a splash with her address to the United Nations to launch the #HeForShe campaign for gender equality. The speech has had a stunning impact around the globe. It focused on an important issue, but it wasn’t in fact earth-shatteringly new. It asked for gender equality, without focusing on women and girls only; men and boys were part of the story too. Watson pointed out that men suffer from stereotyping of gender roles as much as women do. The “macho” type has left many men feeling unacknowledged, victimised and unsure of their identity. There’s a bit of a macho movement going on in Christian circles here and there too. I have no time for it; it will end in tears, and already is in some places. Broken men do cry. Watson’s speech was genuine, heartfelt and clear. But why should an actor speak with authority? Sorry to all the actors out there, but your views on gender (or refugees, or war, or the economy, or even coffee, George Clooney) should be proportionate to your expertise and experience. Just because you speak impressively and present well doesn’t mean we should all be listening to you. But in this case, Watson had plenty of authority: the authority of female experience. Women report almost universally a sense of being devalued, discredited, sexualised and ignored from an early age. Almost without exception, they tell tales of how their view of themselves became worse and worse as adolescence set in. How their self-image is shaped by male negative opinion. And how most of life is a struggle just to keep your head above water in a male-dominated world. It is a deeply male sin: the disparagement of the woman. It is also a female sin: women are often their own worst critics. But men must face the fact that we have by and large failed to love women as they need to be loved. Controversially, Watson argued that when men are better looked after, women benefit: “…when they are free, things will change for women as a natural consequence”. This freedom should come from a genuine understanding of oneself as a man before God. The gospel of Jesus means that the old ways must not prevail, and unity, love, care and kindness must. In Christ, the old divisions are repaired, including any divisions between men and women. We are “all one in Christ Jesus” (Gal 3:28). As a forgiven sinner, a new creation in Christ, a man is spiritually “free”. That spiritual freedom must play out in more humble, loving, compassionate and gentle relationships. But why are we listening to an actor tell us this, entitled as she is? Why do entertainers have more clout at present than church leaders and other public Christians? It is because we haven’t stepped up and spoken as we should. We have stayed in our safe houses; we haven’t even headed out onto the verandah. We have kept to ourselves, arguing about in-house issues of church management, or musical styles, or which English Bible translation should receive the gold stamp. We should have been leading the way, Wilberforce-style, on issues such as violence against women. Why have we let the “pagans” show us how it should be done? Christians no longer have a moral high ground from which to speak on issues of sexuality and gender. It’s pretty depressing, to be honest, because in each of these areas we have a great deal of good to offer a needy world. We will have to earn back our voice, and it will take us years. Perhaps the successful implementations of the Christian vision of gender are a little difficult to detect in contrast with a globally televised speech at the United Nations. Let’s hope they can become more visible, and quickly, because when our conduct in public view is honorable, when people speak against Christians as wicked, they will in fact “see our good deeds and glorify God on the day of visitation” (1 Peter 2:12).